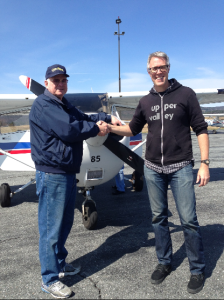 Dave Kent, Chief CFI, congratulates member Matt Bucy after his first solo. While the club doesn’t offer instruction directly, several members are Certified Flight Instructors and make themselves available to other club members for instruction. The club allows zero-time members to join and train. Students receive a discount on monthly dues and may defer some of the aircraft deposit until licensed. Students may reserve up to two hours per week of flight time. More time may be reserved on short notice if aircraft are not reserved by regular members. Training in a club has many advantages. Social support of club members helps students through doldrums and the option to share flights with other members gives students more experience than they would otherwise get. We keep our planes in top shape with maintenance by a Cessna certified maintenance shop. *Dues are prorated if you join mid-month. If you’d like more information about training as a club member, contact us via the following form.